The effect of the low electron wind intensity χ≤10 on the surface topology of an interconnect line with FCC structure having four fold crystal symmetry, and oriented with a tilt angle θ=0 degrees is illustrated. 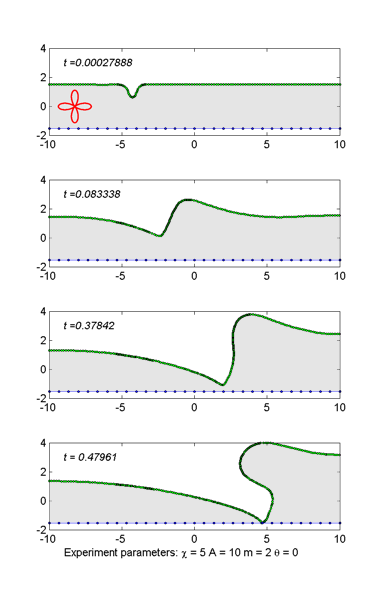 The originally Gaussian in shape edge-void on the surface starts to evolve into a kink shape disturbance , which shows continuous growth in size while drifting towards the cathode end of the interconnect line. At the moderate wind intensities χ≈25 , the kink shape surface disturbance breaks down and creates very large wedge shape internal void, while becoming very close to the opposite sidewall of the interconnect. On the other hand, at e. the extremely high electron wind intensities χ≥50 , the lower edge of the kinked shape surface void grows so much that eventually hits the opposite sidewall before having enough time to break down into internal daughter voids. Therefore this type textures are very critical and cause an open circuit failure by reaching the other edge. The failure time depends on the degree of anisotropy in diffusion coefficient and the electron wind intensity.